Imagine yourself as a whale, cruising the Pacific. It’s hotter these days. There’s plastic everywhere. There seems to be less food to eat. The water seems slippery from oil. What are you thinking, whale? What will the future bring for the young and the vulnerable citizens of our planet? These questions are under consideration in an upcoming art exhibition at 4th Street Fine Art in Berkeley. Contemplating the Future features paintings of whales and human children, in a state of reflection. The exhibit is coordinated with the Lonely Whale Foundation and a percentage of sales will be donated to preserve marine wildlife and ocean health. Maggie Hurley: For this exhibit, Maggie turned her gift for painting whimsical animals and rolling seascapes toward the more serious theme of climate change. 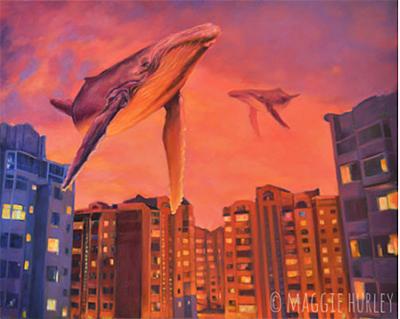 Her work for this exhibit features humpback whales swimming down streets of major cities. Maggie’s delicately wrought details draw the viewers in and her sense of humor expressed through painting wins them over. Click here to see more of Maggie's work. Sherrod Blankner: Known for her landscape paintings, Sherrod has focused on figurative work for this special exhibit. Using delicate light and lush oil tones, Sherrod has brought to life scenes of contemporary California home life. 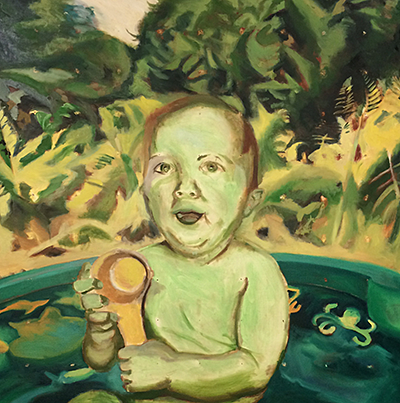 Like Mary Cassatt, she is not sentimental, but rather straightforward in portraying the intimacy of living with children. Click here to see more of Sherrod's work. The Lonely Whale: The Lonely Whale Foundation is dedicated to bringing people closer to the world’s oceans through education and awareness, inspiring empathy and action for ocean health and the wellbeing of marine wildlife. Born out of inspiration from the search for 52Hz, the Lonely Whale Foundation was created in December 2015 by Adrian Grenier and Lucy Sumner with the intent to inspire empathy towards marine species and develop life long advocates for ocean health. The life story of 52Hz is a cautionary tale of the growing epidemic of loneliness and isolation that exists in our own lives and the unanticipated consequences of our choices and actions. The quest to find 52Hz reveals an inspiring message of hope that shows how one lone whale can teach human beings all over the world about the true meaning of connection. Find out more at www.lonelywhale.org.